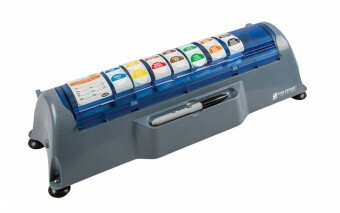 Organize and dispense up to eleven 1" wide label rolls or five 2" labels with the Saf-T-Label dispenser. The dispenser easily separates labels from backing and protects rolls form kitchen messes. STL511 Accepts date label rolls from 0.75"-3" (1.91-7.62 cm) wide; 3.25" (8.26 cm) diameter 7.02" x 19.96" x 5.13"